Pizza has surpassed hamburgers as America's favorite food. Take advantage of that new trend with a pizza cutter. Whether for a pizza parlor's delivery premium or a medical facility promotion, all may promote with this product. Banks, credit unions and insurance companies and hospitals are the top four who use this for promotion. Features of the pizza cutter are Dupont Delrin Acetal plastic construction and never dull cutter blade. Snap apart design for easy cleaning. Top rack dishwasher safe, we recommend hand washing. The overall size of the plastic pizza cutter is 4 3/8" w x 4 1/8" h. Exclusive Patented Product. Each pizza cutter is poly bagged, includes instructions and bulk packed in box. The price includes a one std. color print on one side within in a half circle 3 1/4" dia. The opposite side is available for printed advertising in an area equal to the first. Our account executives will set type or you may request a print size template. color/location add an additional screen & a run charge of $.20 each unit. 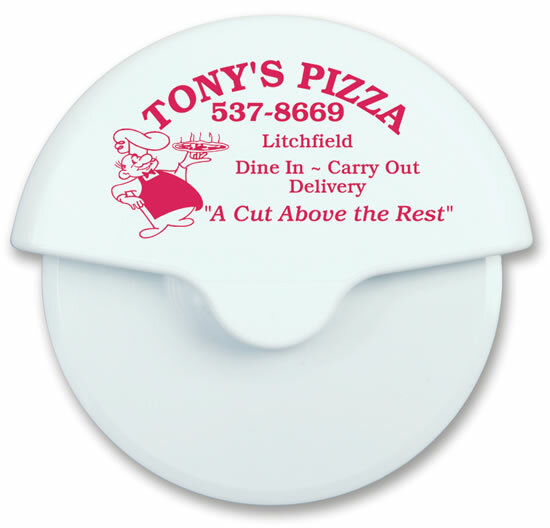 Promotional pizza cutters have a maximum of a two color print.